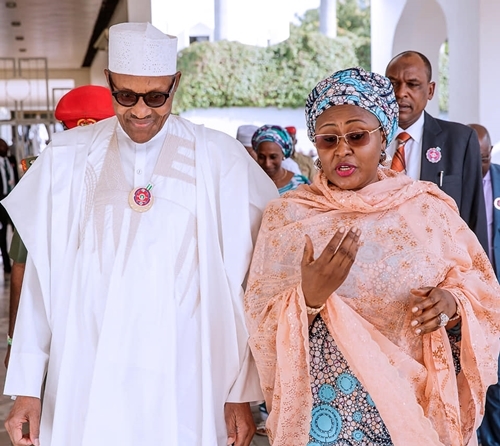 President Muhammadu Buhari, on Monday, appointed his wife, Dr. Aisha Muhammadu Buhari as member of Presidential Advisory Committee on the Elimination of Drug Abuse. The Committee has the former Military Administrator of Lagos, Brig. Gen. Buba Marwa, retd, as its chairman. According to Vanguard, the President also inaugurated the Ministerial Steering Committee which is headed by the Secretary to the Government of the Federation, SGF, Boss Mustapha. Speaking while inaugurating the two committees at the Presidential Villa in Abuja, the President called for collective action to help those enslaved by drugs build a new life. He noted that the challenges associated with drug abuse had grown to become a major public health problem in the country, lamenting that Nigeria, hitherto considered as a transit nation for illicit drugs before 2013 had now been internationally recognized as a user nation. President Buhari recalled the disheartening statistics of several reports including the National Drug Law Enforcement Agency which revealed that about three million codeine syrups bottles were consumed daily in Kano and twice that amount in the North-West region of Nigeria alone. He said that use and abuse of drugs by adolescents have become one of the most disturbing health related phenomena in Nigeria and other parts of the world. He said said that in many schools and growing adolescents experience mental health issues, either temporarily or for a long period of time, while some become insane, cannot remain in schools and eventually drop out. “Drug and alcohol abuse are also major occupational hazards among Nigerian workers, professionals, notably drivers, which contribute to making Nigerian roads particularly dangerous. The drugs that are commonly abused include but not limited to alcohol, cigarettes, caffeine, Tramadol, codeine, etc. “Today marks the beginning of another milestone in correcting the root cause of some of the ills of today’s society in order to safeguard our common existence and guarantee a brighter future for our current generation and those yet on born. 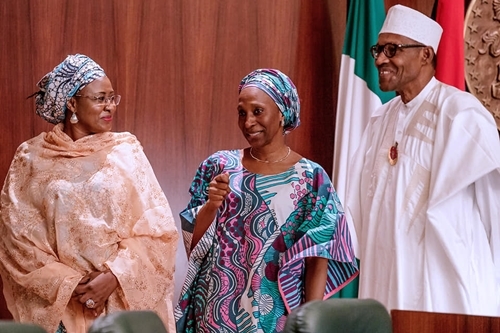 President Buhari commended his wife for demonstrating passion and commitment to the cause by galvanizing the participation of First Ladies from the states through the Governors’ Wives Forum in conducting an assessment of the challenge in their respective domains, with the view to proffering measures to combat the menace. 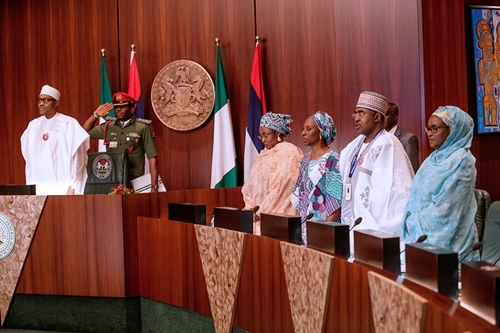 He said, “The appointment of the wives of the President and the Vice-President as well as the Chairpersons of the North and South Governors’ Wives Forum as members of this committee is in recognition of their concerted efforts to the course of eradicating the menace of drug abuse from our society. “Additionally, the participation of the First Ladies is meant to spur further involvement of women and mothers in particular, in view of the significant role they play in parenting and care. “It is therefore expected that Governors’ Wives across the federation will take the lead in replicating this intervention structure at the states and local government levels,’’ he added. He stated that the presidential structure at the federal level would facilitate implementation of government’s programmes and projects for effective delivery of policies, while a third level structure was proposed for the States, given the national spread of the malaise and the need for quick action at the root of the scourge. Buhari revealed that the State Implementation Committee (SIC) would be established in all states of the federation to complement federal government’s efforts nationwide.